This is one of the Azhwars' nava Tirupati. As per sthalapurana, Bhoodevi took the name of Sriperai (maning body of Lakshmi) meditated on astakshara as per the advice of Druvasa Muni. Once during the prayers on Panguni (Mar - Apr) poornima, she noticed two pots (kund) in the shape of fish(Maharakruti) and offered it to Lord here and hence the name Makaranedunkuzhaikadan and Kshetra called Sriperia(Tirupperai). 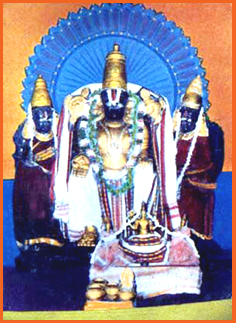 Varuna Obtained salvation from a curse here , by performing Abhishek on panguni poornima day. The Maharaja of Vidarbha desha prayed here and got rain and prosperity in his kingdom which was long suffering from drought (anavrishti). Two Thaayaars (in separate sannadhis) - Kuzhai Kaadhuvalli Naachiyaar, Thirupaerai Naachiyaar. Theertham - Sukra Pushkarini, Sanga Theertham. Access to the temple 3 Miles South-East of Azhwar Thirunagari(Azhwar ThiruNagari -- Thiruchendoor Road). The Moolavar of this sthalam is Makara Nedunguzhaikkandhan. Also named as "Nigaril Mughil Vannan". Moolavar in Veetrirundha (sitting) Kolam facing East direction. Prathyaksham for Sukranan, Rudhran (Lord Shiva) and Lord Brahma. It is approximately 5 kms from Azhwar Tirunagari.Alternatively one can also come here from Thollaivillimangalam There is a chattaram where boarding may be available.There are no facilities for staying here.Swami Manavala Mamunigal has sung about this kshetram.